CONTAINER001 is a standing plastic protein container with an internal volume of 2.4L (2.5 quarts). 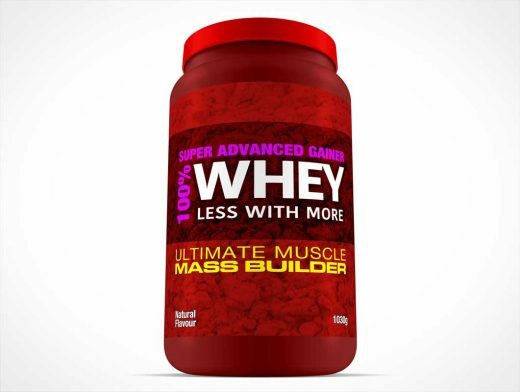 This particular PSD Mockup replicates a popular canister size used to sell protein whey powder products to body builders. By volume, this container simulates a 1kg (81oz or 1030g) product. The final rendered mockup has a slight upward angle from the base of the canister suggesting the product is mighty, and that it is the leader in the product’s category. The generated Photoshop document sports multiple layers allowing the designer to continue to easily manipulate resources for their own particular scenario. The cap and body of the protein canister can also have their colour changed through existing layers which are hidden by default.